Last Saturday was a beautiful autumnal day so Amor and I decided to take advantage of the weather and go for a walk in the countryside. The wonderful thing about where I live is that I have the countryside right on my doorstep. So we took a little drive to Charleston House, parked the car, and started our walk up to Firle Beacon. The weather was a bit overcast with a slight breeze, but fortunately it didn’t rain. Unfortunately, the sky was a bit dull and did not inspire me to take many photographs. It had been a while since my last walk in the countryside and walking up the hill had me a little bit out of breath, but the view from the top was worth it. 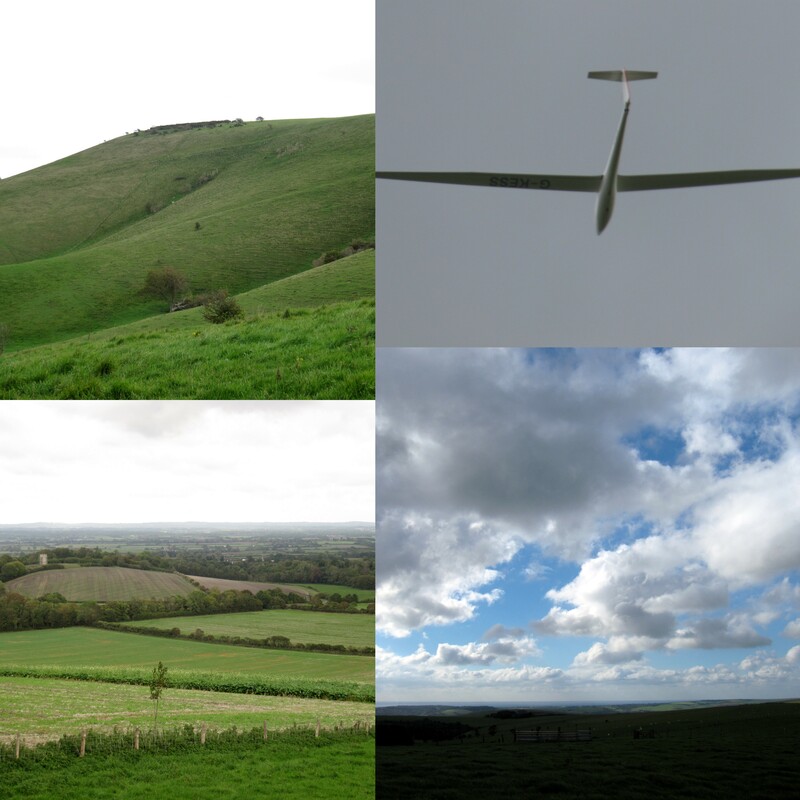 There were quite a few gliders soaring silently in the sky and riding the thermals. They were quite mesmerizing to watch. At the top of the hill, keen model airplane enthusiasts were remotely flying their model gliders. From a distance, they looked like the real thing as the models were very big. It reminded me of the days when my dad would take me and my brother out to a deserted air strip to fly model planes that he built. Once at the top the only way to go was down, in search of lunch. Not having been to Firle before, we were hoping that there would be a pub. As far as we were concerned any village worth its salt should have a pub. The first port of call however was St. Peter’s Church. Parts of this church date as early as 1200 AD. 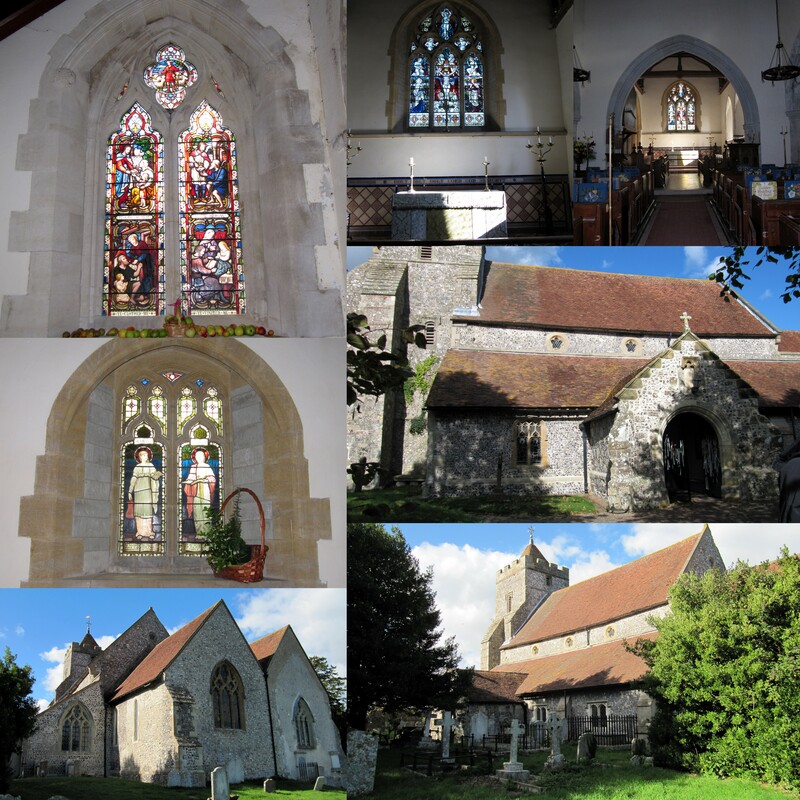 It is a plain, yet attractive little church with monuments within dating from 1476. It is worth having a look if you are in the area. As we wandered through this little village, we did indeed come upon Firle’s only pub, The Ram Inn. The place was very busy and full of locals and visitors alike. Not wanting anything too heavy, we ordered a ploughman’s and a chicken salad sandwich with a side of chips, which were more like frites. As the weather was lovely, we ate outside. The food was good, the bread home-made. The main courses looked interesting and we would consider coming back, perhaps for Sunday lunch. I tried the Perry. I have never had Perry before and wasn’t quite sure what to make of it. It wasn’t cold or fizzy and didn’t taste anything like pears. It wasn’t sweet and it wasn’t tart. In fact, it was kind of bland and after reading about perry on the internet, I am not so sure if what I had was actually good. After lunch, we wandered back through the village to find a path back to Charleston. The village is very pretty and quite old. There was a jumble sale taking place in the little village hall. We found a path and walked across the grounds of Firle Place. There were cows everywhere. It seems that Firle Place is open only in the summer. Something to remember for next year. 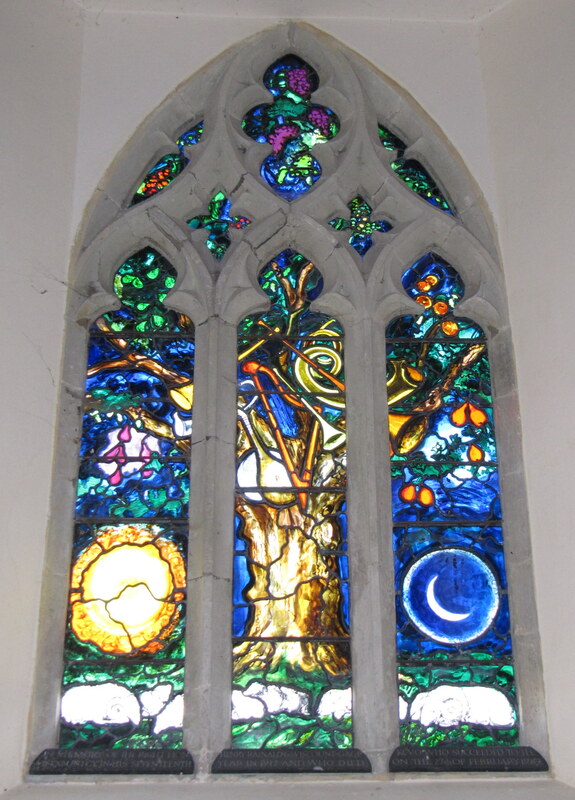 You can read about Firle here and here. If you like country walks, quaint pubs and villages, then visiting Firle should be a pleasant experience. We liked it! I am a first generationHungarian American. Both of my parents are from Budapest and arrived into the United States around 1950. 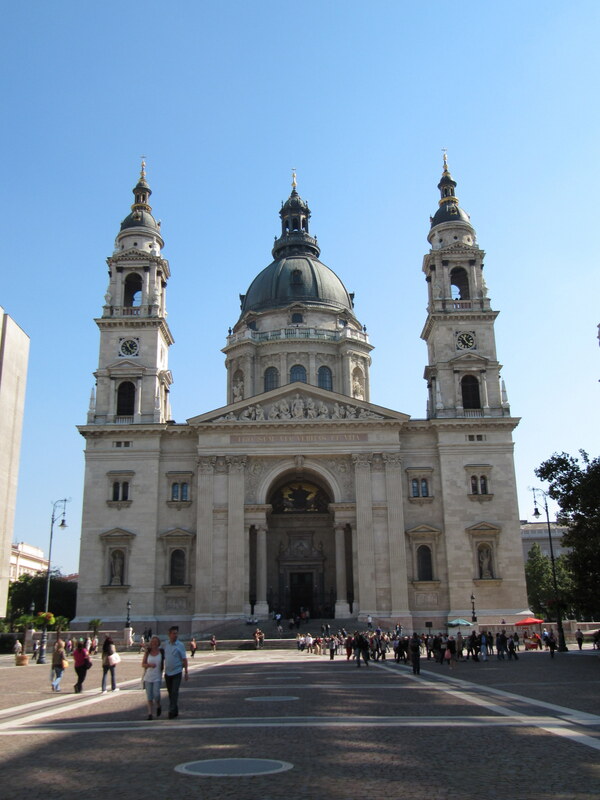 I was fluent in Hungarian until I was about 7 or 8 years old and was brought up with a great sense of being Hungarian. This was reinforced by conversing with my grandparents and other relatives and family friends in Hungarian, eating Hungarian food, and listening to Hungarian folk music. 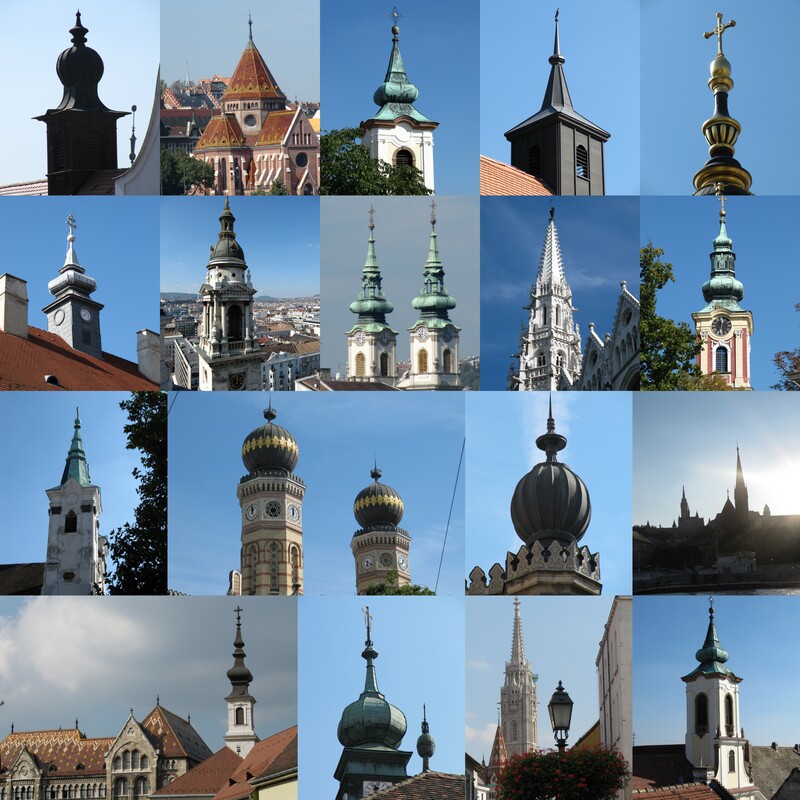 I first went to Budapest over 10 years ago. I had this huge feeling of deja-vu and didn’t know why. The smells were so familiar, the buildings were familiar. Everyone was speaking Hungarian. Duh! That was extremely familiar, even though I really didn’t know what people were saying. I know Hungarian when I hear it, and when I do, my heart skips a little beat of joy! It took me a few hours to work out where this feeling was coming from and then it hit me! The smells were the smell of garlic and pickles and other food smells that I grew up with! I recognised some of the buildings and parks because my grandmother had shown me many photographs from her visits! In a way, I have already been here before. 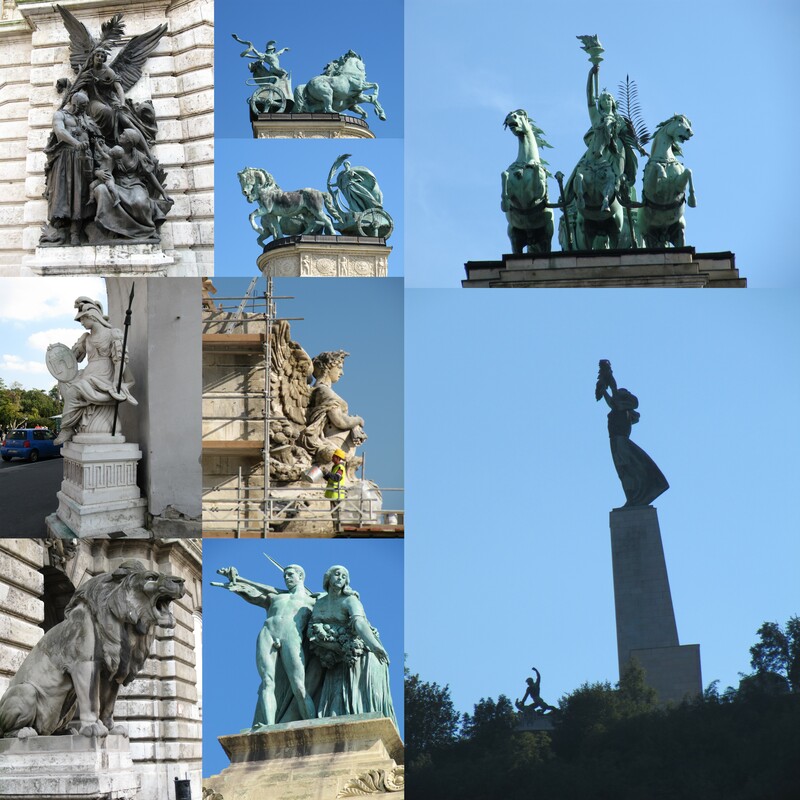 My first trip to Budapest was very short and at the time not many people spoke English. I also went in November – not a very good month of the year to hob nob with the locals. There was barely anyone on the streets. This time I went in September immediately after my trip to Sharm. I went with my daughter and was a replacement for one of her friends who had to cancel. Stuff happens and although I wasn’t her first choice, we managed to have a good time. In any event, she didn’t have to pay a penny for anything while we were there! Besides, what better guide than someone who has already been there? We stayed at the Opera Gardens Hotel in the centre of Pest. The staff and service were excellent – very helpful and accommodating. The rooms are modern with access to wi-fi. The hotel also had a jacuzzi and sauna that we utilised one evening and had all to ourselves. 🙂 We were on a bed and breakfast basis. There was a small dining area for guests with fresh fruit salad, yogurt, cheese, cold meats, fresh bread and pastries, coffee, tea, juice, cereals, eggs, bacon, and cake. I am not a big breakfast eater, but considering I had just spent 2 weeks diving with the hotel breakfast leaving a lot to be desired, I made the most of what was on offer for breakfast at our hotel. I confess to having cake as part of my breakfast. In my opinion, it is no different to eating bread but with the added bonus of fruit in it. We were lucky with the weather the week we were in Budapest. It was sunny every day and went up to about 80F. As the weather was so lovely, most of our sightseeing was done outdoors. 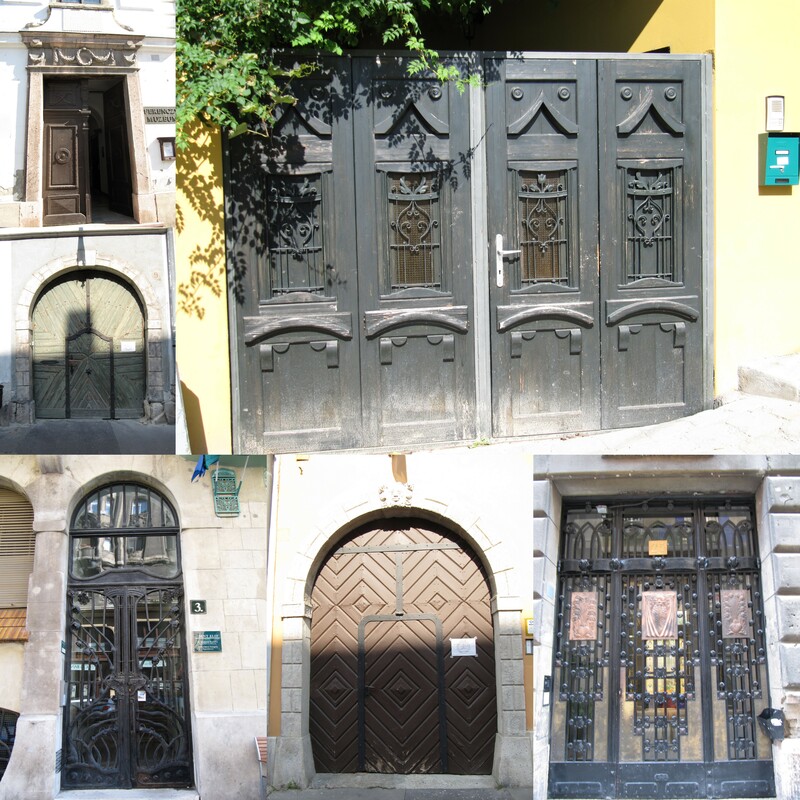 We only went into two buildings and that was Szent István-bazilika or Saint Stephen’s Basilica and The House of Terror. 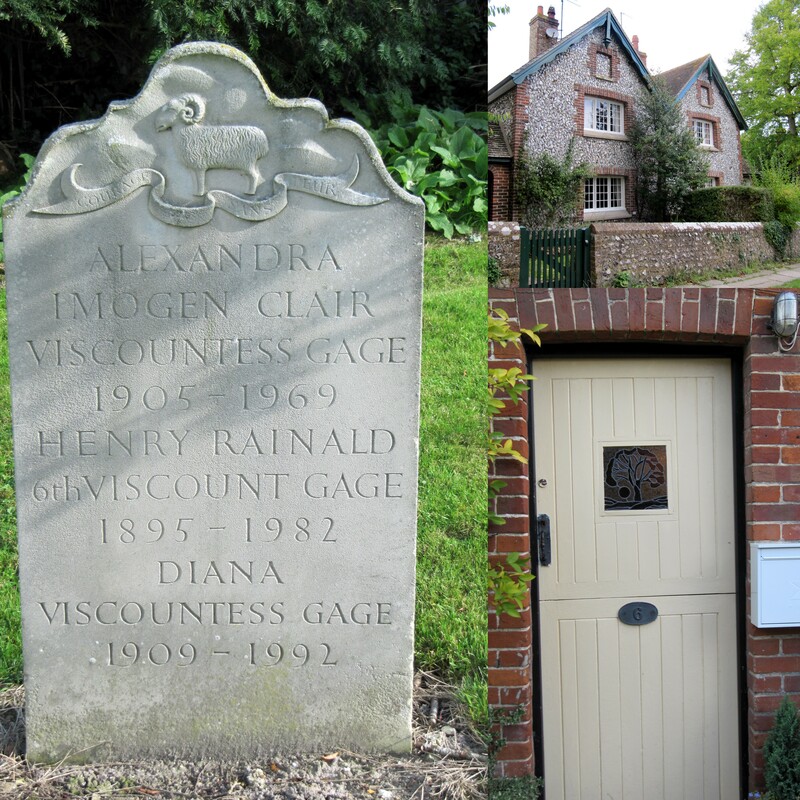 We couldn’t have chosen two completely different buildings to visit and for different reasons. I highly recommend walking up to the dome in the Basilica for the amazing panoramic views of Pest. It is worth visiting The House of Terror if only to be humbled and to try to understand the horrors that took place against many citizens of Hungary and Budapest. The place totally freaked us out. I would also recommend one of the many river boat rides available. 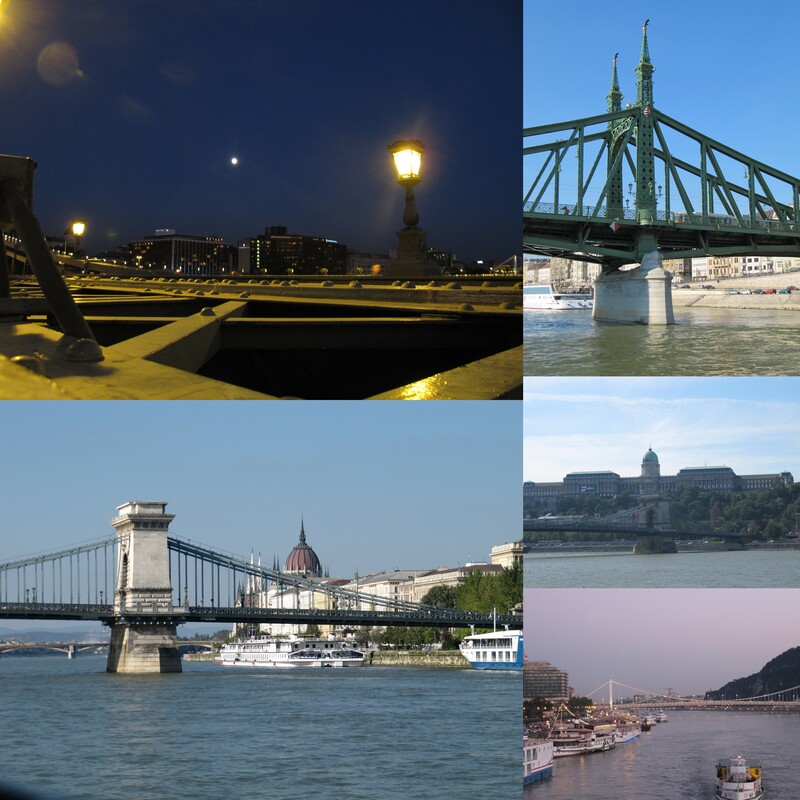 On our arrival to the airport in Budapest, I purchased a two-day Legenda pass which included a boat ride and a visit to St. Margaret’s Island (Margit-sziget), as well as mini-bus transfer to and from our hotel. The weather had been so lovely, so I don’t think we really made as much use of our pass as we could have. As we were centrally located, it was actually very easy to walk around the city and see most of the sights. If the weather had been more inclement, we may have made more use of public transportation and gone into more museums and art galleries. As it was, we went on a bus, tram, and the Underground from Hero’s Square. The Underground is very easy to use and is one of the oldest in Europe. I love walking and looking at the architecture and people. What better way to get to know a city than on foot? Here are just a few photographs. After all that walking, it makes sense to stop for a cake break. 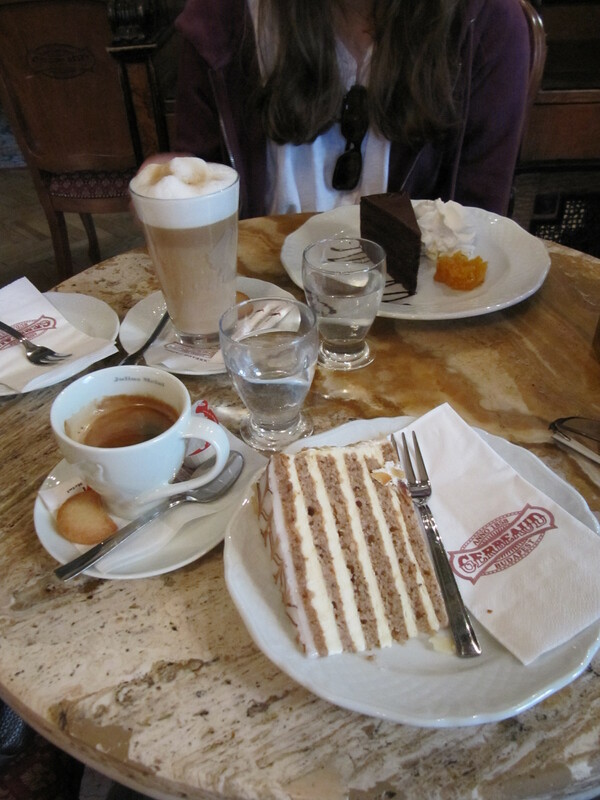 There are many cafés where you can sit down and have coffee and cake. As it is tradition to have cake in the afternoon, and since I like to keep up with tradition in the places I visit, we had our first cake experience at Café Gerbeaud. It may be on the tourist map, but for very good reason, the cake is excellent. It is one of the oldest coffee houses in Pest and the building is beautiful. Café Gerbeaud was one of many places where we took sustenance. We were very lucky with the quality of our food. As well as traditional Hungarian cooking, one can get almost any type of food in Budapest. We had lunch wherever we happened to be out and about and ate dinner at restaurants within walking distance to the hotel. One of the highlights of our trip was meeting up with some friends of mine who have been living in Budapest for the last year. 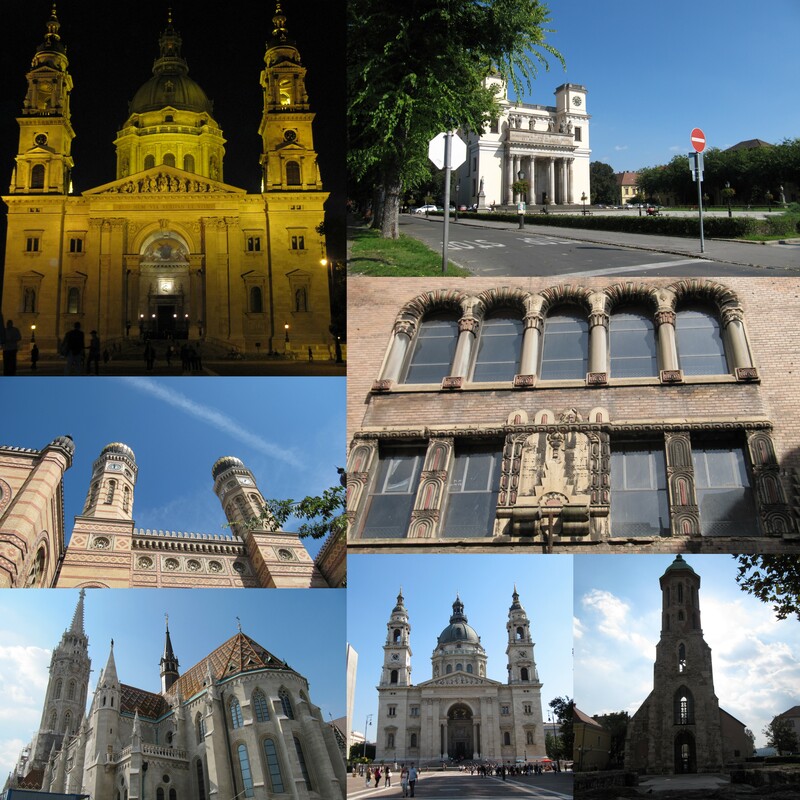 Gary kindly offered to drive us out of Budapest for the day to visit a couple of pretty towns. 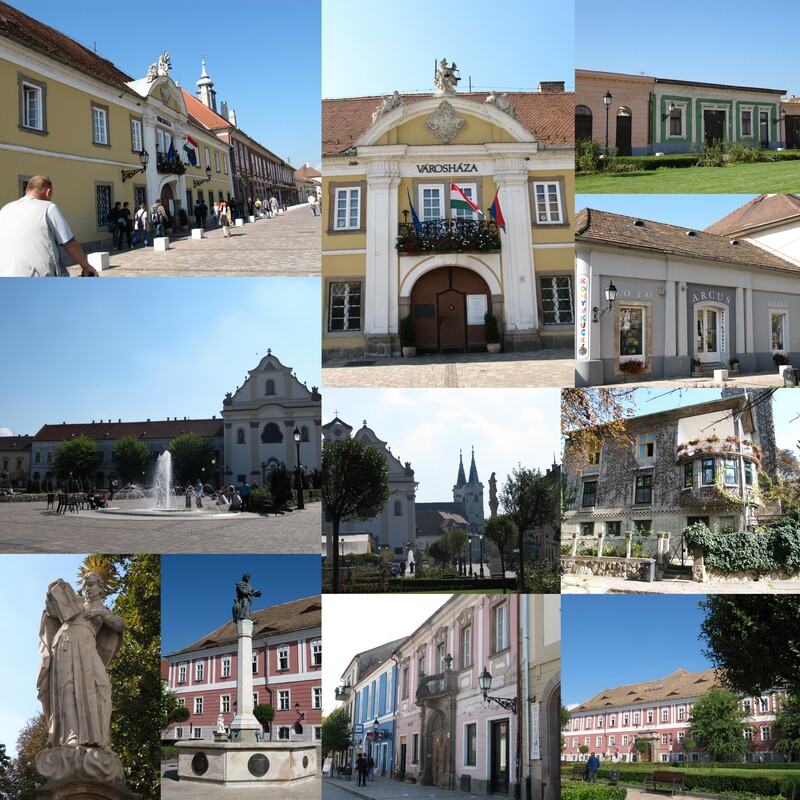 The first town we went to was Vác. The old part is not very big, but it is very pretty and not touristy. It has a very pretty square where we found a café and had, you guessed it, coffee and cake. The weather was so lovely it was nice to hang out for about an hour and relax from the bustle of Budapest. Gary is a great tour guide and knows a lot about the Architecture of Budapest. We had a running commentary from our hotel to his flat, where Nancy carried on with a tour of their apartment, which was amazing! I thought I had high ceilings! After we had seen Vác, we got on a ferry to cross the river to drive over to Szentendre. 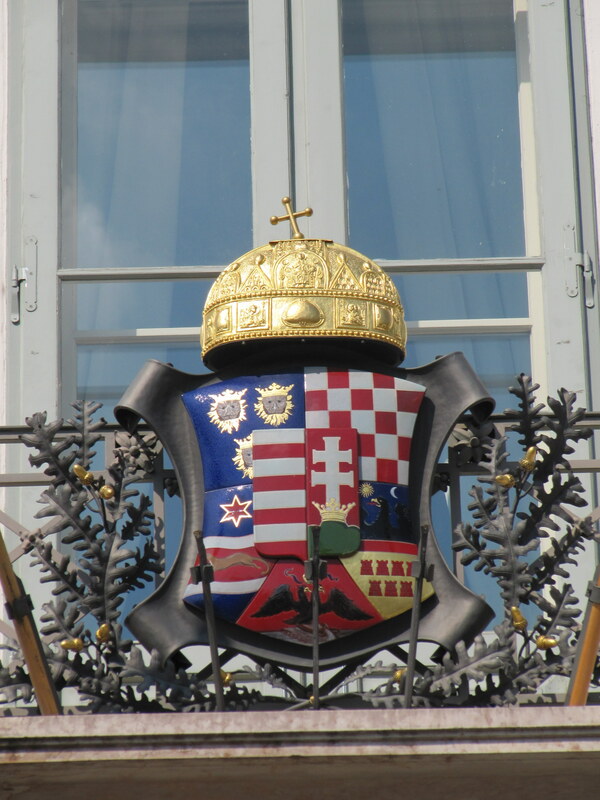 Szentendre is completely different in character to Vác. It is extremely touristy with many shops selling tourist tat. I am sure there are some lovely shops selling local crafts, considering it is an artist’s town, but we tried to stay away from any attempts at being lured into the shops. We did stop and have a snack/lunch of Palacsinta. Traditionally, in my family, these pancakes were served sweet, as a dessert. Fillings were generally apricot jam or Lekvár (thick prune jam/butter) or a mixture of sour cream, sugar, cottage cheese and raisins (my favourite), all topped with powdered sugar. It is one of the few Hungarian foods I can make and am particularly fond of eating. However we had savoury ones for lunch, although I really was tempted by the chocolate one (just like in the link). Our last day was spent by the Parliament building and walking along the river towards the Jewish Quarter. The architecture is not as grand here as in other areas. I would have liked more time to explore, but we were limited and had to get back to the hotel. What more can I say about this trip? I can honestly say that I have felt extremely at home in the city where my family has come from. I love the fact that Hungarian is the main language that is spoken. I love being in a city where people look familiar to me and where they remind me of people from my youth. The girls are pretty and look like my cousins. The boys and men can be really good-looking. Call me shallow, but its great to look at attractive people in attractive surroundings. The people have been generally friendly and service has been very good. There are a lot more people speaking English than they did ten years ago, but I still like to try to use the few Hungarian words I still remember. We went back to Sharm el Sheikh, stayed at The Ocean Club Hotel, and dived with Ocean College. This time we booked our holiday with Sportif Dive Holidays. (you can also find them on Facebook) There was a great deal going for one week that included flights, transfers, hotel, B&B and 5 days diving with Ocean College. The Divemaster called them and inquired about a deal for two weeks and Phil came back to us with an offer that we couldn’t really turn down. For about the cost of a third dive, we were also able to get an extra day of diving in. Also, by paying an extra supplement, we got an evening flight on British Airways. Although we arrived the next morning at the crack of dawn, it was worth paying the extra money to get decent seats, extra carry on allowance, a meal, and free alcohol. On arrival at the new terminal (very nice), we were greeted by a pleasant young man who guided us to the shortest queue for visas, waited while we collected our luggage, and then took us to the minivan, which we had all to ourselves! Because our room was booked for the previous day, we were able to go straight to our room and go to sleep. This was probably the nicest and easiest trip to Sharm I have ever done. One of the best things about this particular trip has been seeing familiar faces. The Divemaster has been to Sharm many times over the years and completed his divemaster training with Ocean College (I was there the week he qualified and where we first met). It is no surprise that The Divemaster is on familiar and friendly terms with many of the staff. As well knowing many of the diving instructors and staff, quite a few who have lived in Sharm for many years, we also know other divers that we keep crossing paths with. There were quite a few familiar diving faces on this holiday. We have been very privileged to be invited out to dinner or a BBQ or to meet up for drinks by the ‘locals’. We were especially honoured to be invited to the wedding renewal vows of two members of the Ocean College staff. Once people knew we were coming, the invitations to do something came forward. That was really lovely and gave us something extra to look forward to. As usual, there were also new people to meet and new friends to make. Day 1: Cancelled dive that was scheduled by mistake. There was noooo way we were going to get our act together having only just gone to bed at 5 am. Spent the day by the pool acclimatizing and catching up with a few people. Day 2: Ras Mohammed – dived Jackfish Alley and then The Alternatives. Nothing big to see, but very pretty and good start to our first day of diving. Day 3: Tiran – dived Ras Bob/Nasrani and then Gordon Reef. Highlights: Moses Sole, Phyllidiella pustulosa nudibranch and Bearded Scorpion Fish on Ras Bob. On Gordon, while looking under a piece of coral to get a good look at a giant puffer fish, a Red Sea Walkman jumped in front of me and gave me a bit of a fright as I hadn’t realised I was so close to it as it looked like a bit of coral. Apparently, these are rare and if seen it is usually at Dahab. To top it off, The Divemaster and I were attacked by a little Damsel Fish. It bit The Divemaster on the hand and then had a go at me. When we realised we were too close to its nest, we swam away with the little bugger coming after us the whole way. It got me on the leg and the bum. Good thing I was wearing a full wet suit. Day 4: Local South – Middle Garden and Far Garden (drift). I love the Gardens. There may not be anything really big to see, but the corals are quite beautiful and there is a lot of stuff going on with the smaller fish. The biggest thing I saw on Middle Garden was a giant puffer and there was a huge free-swimming Moray Eel on Far Garden and a giant porcupine fish. Day 5: Ras Mohammed – Shark and Yolanda and Ras Ghozlani. I think Shark and Yolanda was my favourite dive site for this trip. We did it several times, in different ways, and it was different every time. There was a bit of a current and so it was not possible to get around the front of Shark to get to Yolanda and the wreckage, so we mainly stayed in the saddle at the back of the reef. The Divemaster and I prefer to go this way first as we usually see something good. We found a young turtle eating the broccoli coral and a huuuge Moray eel. We couldn’t get all the way around the back to the wreckage as the current was too strong so we turned around and headed back to the front of Shark where there was a massive Barracuda getting his teeth cleaned. There were also some very large Spade fish and Jacks hanging out in the current waiting for something good to come their way. We were lucky to end our dive with a visit from another turtle. Ras Ghozlani, as pretty as it is with lovely corals and little fish didn’t have as much big stuff, although I did see a free-swimming Moray at the end of the dive. Day 6: Tiran – Woodhouse Reef and Jackson Reef (South Coral Garden). Woodhouse is a lovely drift dive. I was watching some strange behaviour of a school of blue fusiliers when I spotted an Octopus! (still waiting to see the photos! you know who you are!) It was pretty freaked out as it kept changing colour from light to dark and was well camouflaged as it took the Divemaster a while to see it even though he was right in front of it (this happened a few times on this trip!) On Jackson Reef, there was so much to see I didn’t know where to look. Big, huge tuna, moray, puffer and porcupine fish. A turtle. Nudibranch (Chromodoris annae). Big and small. Wonderful Corals. Day 7: Dahab – The Canyon and The Blue Hole. The Divemaster and I had never been to Dahab before so we scheduled a trip. It was an early start, before breakfast. The drive out was not that interesting. Dry mountains that looked pretty much the same. Took just over an hour. Dahab is shore diving. We dived The Canyon first. We had to swim against the current to get to The Canyon. Not much to see on the way to the canyon. A group of Japanese divers were taking photos of each other in various group poses and churning up a lot of sand. Not very good for the coral. At the end of the dive I fell over getting out as my foot got caught in some rocks and I couldn’t move. Banged my knee really good (still sore after 3 weeks) Hmmm! We went through The Bells to get to The Blue Hole. There is a bit of a walk here, but as I hurt my knee, one of the lads carried my BCD/tank/weights. Getting in here was easier than at The Canyon. I didn’t go through the Arch (I don’t like tight spaces), and because I didn’t, I saw a lovely red anemone with its Clown fish. There were some interesting fish and pretty coral to look at on the way to The Blue Hole (which is not as big as one would assume) and was much nicer than I thought it would be in comparison to diving the Canyon. There is not much in this part of Dahab except for some restaurants and a toilet. We chilled in a section of one of the restaurants on rugs and cushions in between dives. We ordered our lunch which was ready for us when we returned after diving The Blue Hole. Because of the altitude on the drive back to Sharm, we had quite a long rest period after our last dive. The whole atmosphere was very relaxed. Would I do this trip again? Probably not, but I would like to go and stay in the town of Dahab to see what it is like and maybe dive another one of the dive sites and look for seahorses. Day 8: Naama Bay – House Reef at The Hilton Fayrouz. Another shore dive, but my knee was feeling better. Ocean College have their main base here and we decided to try the house reef based on the rave it was given by a couple of our friends, both photographers, and both going completely loopy over photographing the small stuff. At the start of the first dive I saw four puffer fish, a box fish and a moray eel. Once we got to the barge, we could see it was indeed covered with some coral and was host to many small fish, including a little school of teeny baby barracuda. Our second and last dive of the day was my 100th dive! And I did not do it naked! 🙂 In fact, The Divemaster and I kept it very quiet until afterwards! Ha! We saw all the small stuff as before, plus a couple of Eagle Rays and a big grouper. As much as I enjoyed the dives, unless one is trying to get the perfect photograph of the little things, I would prefer to go out on the boats. The diving is quite shallow, so it is possible to have some very nice long dives when taking pictures. The deepest I went was 16 metres. You don’t really want to go deeper than that. Day 9: Ras Mohammed – Temple and Ras um Sid. 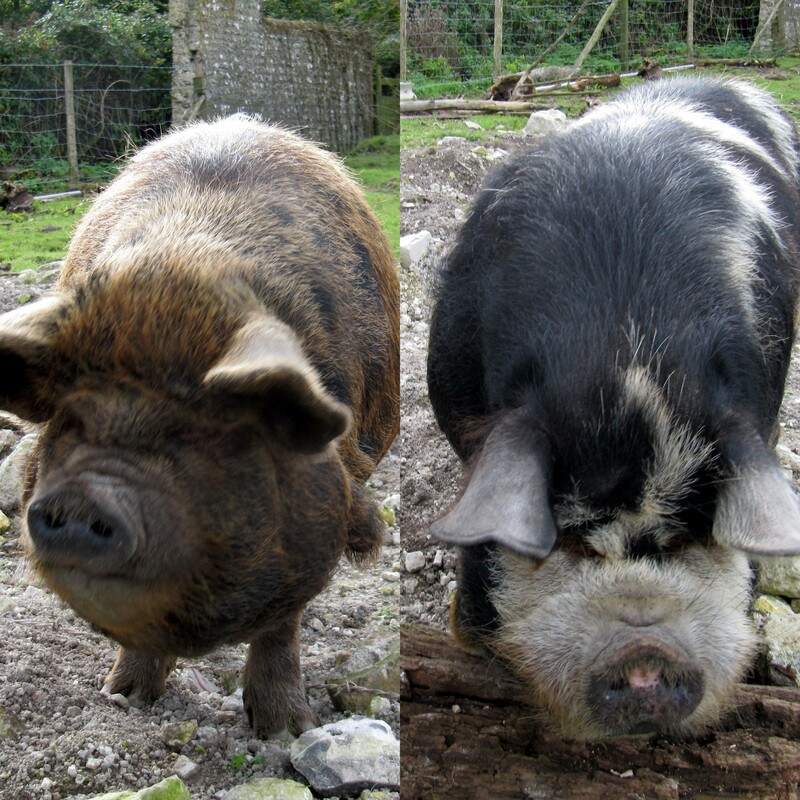 As well as the usual suspects, there was a massive (when I mention massive or huge, they were really massive and huge!) grouper getting cleaned, a turtle, and very large butterfly fish on Temple. Ras um Sid was a gentle dive with a crocodile fish at the beginning. I love the corals here. Day 10: Ras Mohammed – Shark and Yolanda and The Alternatives. We stayed on one boat for the rest of our trip as we really liked the crew and food and just went where the boat went. We were able to get around the back of Shark and Yolanda to the wreckage and we saw a HUGE Moray eel and a green sea turtle. Really lovely. There wasn’t much to see at the beginning of The Alternatives, but our guide found us a LEOPARD SHARK! Yay!!! It was the first one I’ve ever seen. It was just lying on the sand, minding it’s own business. It was beautiful. After that, there were loads of lovely fish to see, and another red anemone. Day 11: Day off to go to wedding renewal vows at The Hilton Waterfalls. We had the morning to chill and hang out by the pool before getting ready for the nuptials. There was a bit of a hic up which delayed everything, but the ceremony was really lovely and the food was excellent. The evening sky was pretty awesome too! As we were diving the next day, we called it a night before round two started with the evening entertainment. Day 12: Ras Mohammed – Anemone City/Shark & Yolanda and The Alternatives. We started at Anemone City which is aptly named because of the myriad of anemones and clown fish on this little reef. Some of the anemones were very large, which shows how healthy this little reef is with the amount of nutrients passing through it. It is very pretty. Then we swam through the blue to get to Shark. This day was my turn to find things around the back of Shark. I found a nudibranch, scorpion fish, a couple of moray eels, crocodile fish, a HUGE moray that The Divemaster had a hard time seeing and thought I must be narked until he put his head too close! Ha Ha! I even saw things that The Divemaster didn’t because there was a wee bit of a current round the back. I think I saw about 5 morays and one was free-swimming. They are so beautiful when they do that. At The Alternatives, we tried to find the leopard shark again, but no luck. However, the bearded scorpion fish at the end of the dive were still there from the time before. They are always cool to see as they blend into their surroundings so well they can easily be overlooked. 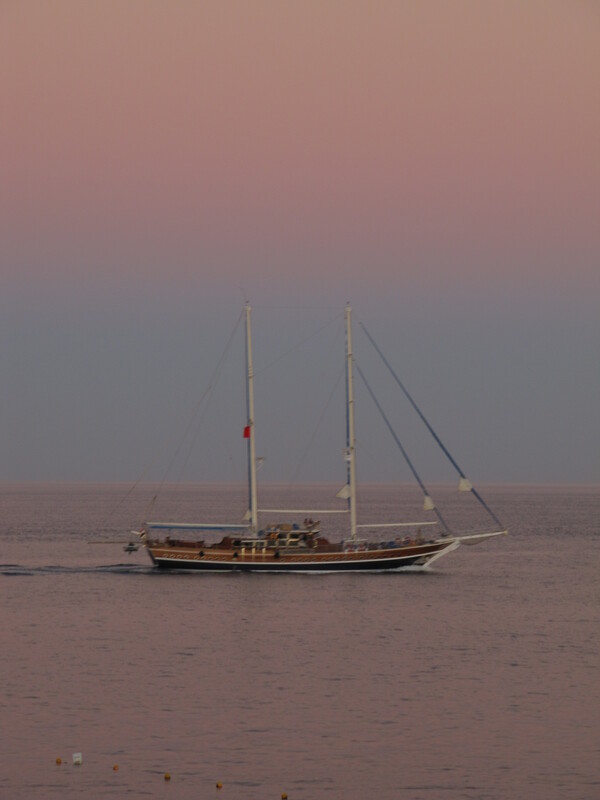 Day 13 – Ras Mohammed – Ras Za’atar and Shark & Yolanda. This was our last day of diving. We had heard there were big things off of Ras Za’atar and so we headed there first. Two lovely turtles swam right past us and very close. I love them as they are so cute. We saw something in the blue and it turned out to be a Marlin. There were a few, but I only saw one, very faint but exciting just the same. Shark and Yolanda was our last dive of the holiday and as usual, it did not disappoint. This time it was The Divemaster’s turn to be the fish spotter. We were finally able to go around the front of Shark. There were four crocodile fish at the start of the dive, 5 moray eels, and a GIANT trevally getting cleaned at a cleaning station. It was huge! We also saw a very large Napoleon wrasse. There was only a gentle current so we were able to have a really good look around the back. It is also interesting to note the different fish that come out later in the afternoon. There were loads of Damsel fish out and after what had happened earlier in the week, I tucked my arms in! If you listen, you can sometimes hear them make a noise, like a little chirping sound. They seemed to be more interested in mating than in biting me, so I was safe. What a lovely dive to end the holiday!